An English Language student at The Sixth Form College, Solihull has won a journalism competition that the English department put on with the help of an ex-student. 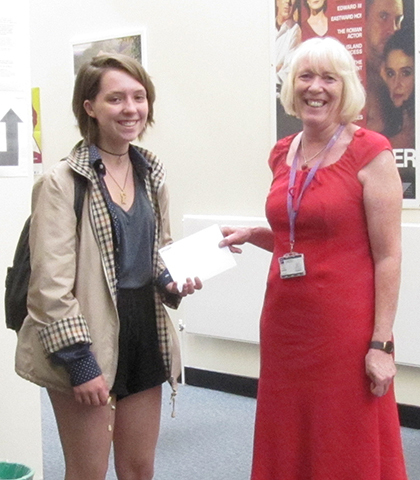 Phoebe Baker won the Language and Technology writing competition at the end of term. Students were encouraged to enter a 750-word article concerning journalism in the digital age. They were encouraged to think about the impact of platforms such as Twitter, Facebook and blogs on mainstream media and how Google impacts on journalism. The competition was judged by ex-student Jon Wilks, who now works as an online journalist. As well as Phoebe’s award, other English students received awards (and cupcakes) at the end-of-term department prize-giving. They are pictured above with their teachers and Principal Martin Sullivan. Teachers were asked to pick out those Year 12 students who shined the most during the 2016/17 academic year because of their achievement levels, commitment and hard work.